Have you ever experienced total energetic alignment? Let me tell you, if you’re able to achieve this – ANYTHING is possible. When you balance each of your energy centers, you harness your power in its entirety, and connect fully with your Highest Self. Achieving this sense of perfect balance isn’t always easy, but with my 9 Chakra Perfume Set, you will be able to open up and balance each of your Chakras, so that you may walk through life confident and at peace, completely in flow with the movement of the Universe and your place within it. To delve more deeply into the world of chakras, order my book The Ultimate Guide to Chakras by clicking here! The first potion that you will receive in this set is one (1) 15 mL bottle of my Earth Star perfume. The Earth Star Chakra is located twelve inches below the soles of your feet, and is what connects you to the Earth’s magnetic core. 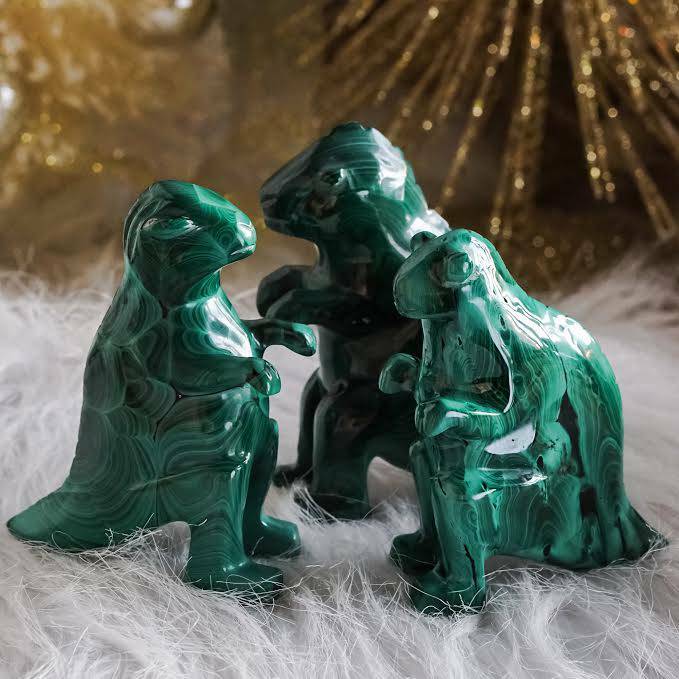 When this Chakra is aligned, you will feel more connected to not only your most authentic self, but to the entire planet and the Universe at large. I designed my Earth Star perfume to bring this energy center into balance. A rich, earthy blend of apple, ginger and sandalwood that has been infused with a black tourmaline chip stone, Earth Star will invoke power, courage, and stability on your journey toward spiritual expansion and transformation. The second potion that you will receive in this set is one (1) 15 mL bottle of my Muladhara perfume, which I created to align your Root Chakra. This Chakra is considered the first energy center of the physical body, and it resonates with feelings of groundedness, security, and stability. When this Chakra is aligned, we feel safe and protected. My Muladhara perfume is a deep, earthy blend with a touch of zest, blood orange, and musk, and has been infused with a garnet chip stone for added strengthening, protective, supportive, and inspiring properties. Anoint yourself with this blend as a form of spiritual armor while you march forth to claim your unique power and Divine gifts. The third potion that you will receive in this set is one (1) 15 mL bottle of my Svadhisthana perfume. The Svadhisthana, also known as the Sacral Chakra, governs our emotions and our sense of sensuality, creativity, and pleasure. 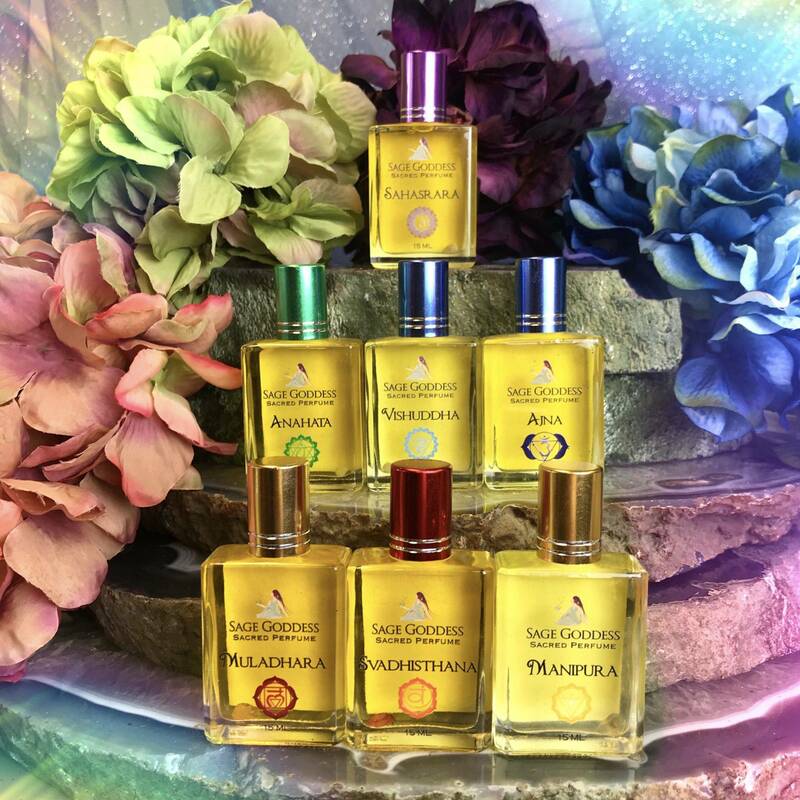 My Svadhisthana perfume is a rich, fiery blend dancing with notes of mango, neroli, and ginger. This perfume has been infused with carnelian chip stones for an extra dose of delicious creative power. Use my Svadhisthana perfume to align your Sacral Chakra and to ignite a potent sense of vitality and passion in your life. The fourth potion that you will receive in this set is one (1) 15 mL bottle of my Manipura perfume. The Manipura, or the Solar Plexus Chakra, is located directly above the navel, and resonates with willpower, courage, vitality, and your desire to take action. My Manipura perfume is a zesty, lively potion blended with turmeric, fennel, lemon, and lime, and was designed to activate your core – your seat of inner power. This fragrance has been infused with a citrine chip stone for prosperity and confidence. Anoint yourself with this blend to evoke a newfound feeling of courage and hope, and to incorporate the light of the sun into your practice. The fifth potion that you will receive in this set is one (1) 15 mL bottle 15 mL of my Anahata perfume. The Anahata, or the Heart Chakra, affects our capacity to give and receive love, and our ability to feel compassion. My Anahata perfume is a heart enlivening, soothing potion blended with geranium, clover and white rose, and has been infused with a rose quartz chip stone, the stone of universal love energy. I designed Anahata to stimulate your heart center. Anoint yourself with this blend to increase your feelings of connectedness, generosity, and overall happiness. The sixth potion that you will receive in this set is one (1) 15 mL bottle of my Visuddha perfume. Located at the center of the throat, the Visuddha, or Throat Chakra, is the center of honest communication. Working with the Throat Chakra instills confidence and passion in your speech, and banishes fear of judgement, so that your words will not be hindered under scrutiny. Visuddha is a throat-opening fragrance, and contains beautiful notes of ylang ylang, eucalyptus, and sandalwood. Use this potion to awaken authenticity and compassion, and to release uncertainty and fear. The bottle has been infused with a blue lace agate chip stone, for potent clarity of mind and conviction of spirit. 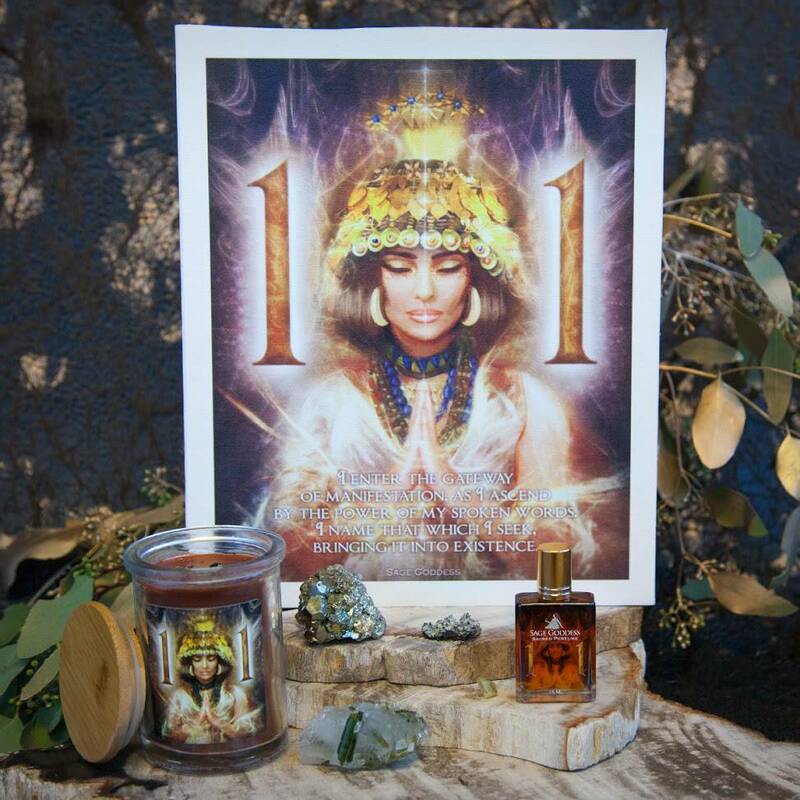 The seventh potion that you will receive in this set is one (1) 15 mL bottle of my Ajna perfume. Located between the eyebrows, just above the bridge of the nose, the Ajna, or the Third Eye Chakra, is the key to unlocking our intuition. A healthy Ajna brings depth and clarity to our visions, and empowers our imagination to visualize and manifest what we desire. I blended my Ajna perfume with jasmine, chamomile, and elemi, to open your Third Eye wide and connect you to your deepest insight. The bottle has been infused with a lapis lazuli chip stone, to powerfully activate your imagination and intuition. The eight potion that you will receive in this set is one (1) 15 mL bottle of my Sahasrara perfume. Located at the top of the head, the Sahasrara, or Crown Chakra, is the key to accessing higher states of consciousness, and ultimately, transcending beyond our personal preoccupations and limitations. The function of this energy center is driven solely by the pursuit of higher states of consciousness. 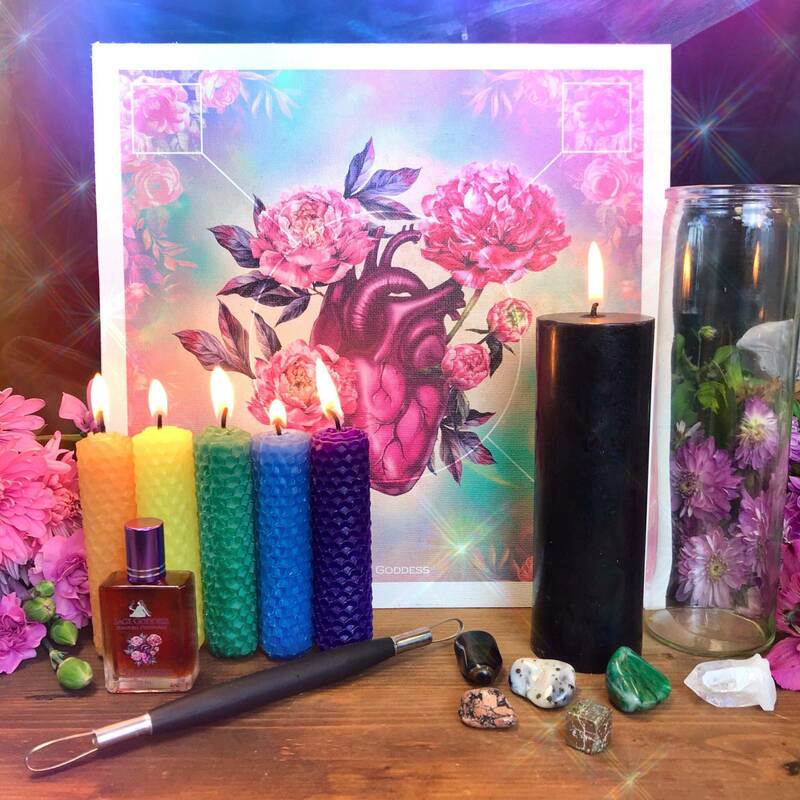 My Sahasrara perfume is a blend of patchouli, lavender, and rosewood, and has been infused with an amethyst chip stone, for potent Higher Realm connection. Use this blend to open up your Crown Chakra and encourage incomparable clarity, enlightened wisdom, and blissful union with All That Is – pure spiritual ecstasy. The ninth and final potion that you will receive in this set is one (1) 15 mL bottle of my Soul Star perfume. The Soul Star Chakra resides above your head, just inches above your physical body. Often referred to as the seat of the soul, this is the crucial point where spirituality and Divine love enter one’s body. The rare oils in my Soul Star blend are meant to elevate you to the Higher Realms. With notes of tuberose, heather, and pineapple, this auric perfume will accompany you as you push beyond the limitations of the physical realm. Anoint yourself with this fragrance and visualize a white light beaming down from above. See it pouring from Source, straight into your Soul Star Chakra, as it opens and activates, connecting you deeply to the Divine. This listing is for one (1) 9 Chakra Perfume Set, as listed above. You may choose from the drop-down menu between a set of nine and a set of seven perfumes. Or if you prefer, you can purchase them each individually. Yours will arrive lovingly parceled for your enjoyment and delight, ready for sacred anointment. May you find complete energetic alignment, my loves, and may you fearlessly walk your Highest Path!